The legalization / attestation of Certificates issued from Rajasthan include the authentication from the regional authorities till the attestation from the Ministry of Foreign Affairs. The attestations consist of Authorities of Notary, General Administration Department, Human Resource Department, Ministry of External Affairs, Embassy or Consulate, Foreign Ministry, Indian Embassy or Indian Consulate etc. This attestation proves that the certificate is issued from Rajasthan and document is authenticated by proving the originality of the same. For using the Rajasthan certificate in foreign countries like UAE, Oman, Qatar, Bahrain,. United states of America, United kingdom, Canada, Saudi Arabia etc.. The first process which should be conducted is the regional authentication for making the certificate legalized. 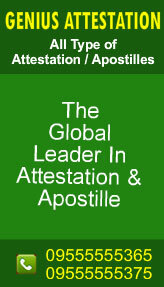 Genius Attestations,the Global leaders in attestation can assist you in all the related procedures from End to End with out your Presence. Rajasthan issued certificate can be attested from concerned departments of India and Abroad.The Educational Certificates issued from Rajasthan and requires attestation includes;SSC, HSC, PUC, SSCE, 12th, BA, B Sc, B Com, MA, M Sc, M Com, BE, ME, B Tech, M Tech, M Phil, Ph D, MBBS, BDS, MD, MS, BBA, MBA, ITI, NTC, Nursing and all other certificates. The attestations from the departments, agencies and other official bodies will validate the certificate and prove its authenticity. This also proves that the certificate is legally issued from the state of Rajasthan and is original. ►Direct Submission, No agents or middle men !! !